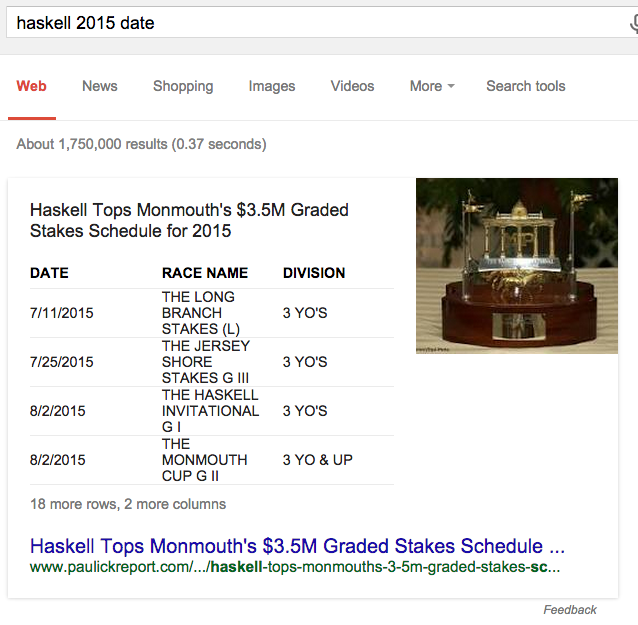 If you were wanting to know the date of the Haskell, like I was earlier in the week, you’d have no luck finding it on the Haskell page of Monmouth’s site. Here, see for yourselves…. OK, if you REALLY scrutinize the screenshot, you’ll see a mention of the date in the text for the first and second news items. This is not what I’m talking about. I’m talking about having the date of your marquee event, that will host a Triple Crown winner (!!! 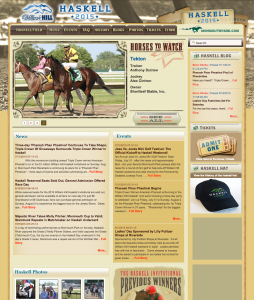 ), prominent in the header of the page for the event, preferably near the big Haskell 2015. This is a good example of how “racing” (in general) doesn’t do a very good of anticipating the needs of customers. Sure, you could argue (if you wanted to, but I’m not sure why you would) that the race is sold out so it doesn’t matter. Certainly there are people who would be willing to fire up their wagering account or even just watch on TV? I didn’t know the exact date and I pay attention to this stuff. With Del Mar and Saratoga upon us, a quick visit to each site yields mixed results. Del Mar does a great job of clearly communicating opening day and the dates for the entire meet, AND the fall meet, AND a newcomers seminar on opening day (well done!). NYRA’s site, currently on Belmont, has a promotion with the date in the second position of its carousel, and it’s the same thing if you click over to the Saratoga site. Not terrible, but it definitely could be better. Are there bigger problems in racing? Yes, obviously. But every business, whether it’s thoroughbred horse racing or the corner deli, can make plenty of small yet meaningful improvements when they start to think from their customer’s perspective. Update: After a brief Twitter conversation earlier today I thought of something I should’ve added to the original post: The competition for racing sites (desktop and mobile) and apps are not only other racing sites, they’re also the daily use sites and apps that have well considered user experiences. Most successful sites, apps and services put a good amount of effort into user experience. As the is bar raised in our daily online interactions it will become even more important for racing to step up its game with regard to online presence, especially if the goal is retain younger people. You can’t get away with the “if they love racing they’ll come back” mentality with millennials, and you can barely get away with in general, I know I’m coming back less and less.